This post is adapted from the blog of SeatGeek a Priceonomics Data Studio customer. Does your company have interesting data? Become a Priceonomics customer. One of the great things about live music is that it is universally available in America: you’ll find concerts in nearly every town and city across the country — from the busting clubs of Los Angeles to the beachside bars of Ashbury Park, New Jersey. Of course, not all music hubs are created equally. Sometimes the artist you really want to see comes to town, sometimes they don't. 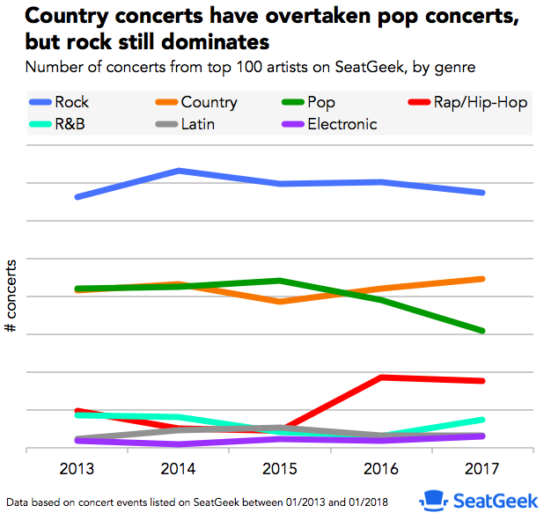 We analyzed data from Priceonomics customer SeatGeek, the largest event ticket search engine on the Internet, and down into their trove of concert data to find out where the biggest (and smallest) concert markets are, and how these markets vary across genre. Las Vegas, NV is, by far, the biggest per capita market in the U.S., with 59 concerts per 100k residents — nearly 4 times the next market (Nashville, TN; 15.4). Coming in 3rd place was the New Haven and Hartford, CT media market. The large media market with the fewest concerts per capita is Waco, TX. For this analysis, we began with five years’ worth of concert events listed on our platform between 01/2013 to 01/2018. We limited this data to the top 100 artists by sales volume in each year, then categorized each by genre. We also limited our analysis to the 100 most populous designated market areas (DMAs), according to Nielsen data. DMAs are regions where inhabitants receive similar media offerings. DMAs capture that the concert is nearby to you, even if it's technically in a different city in the suburbs. Most of the time, a DMA is identified by the largest city in that market, but some are identified as groupings of cities (ie. “San Francisco-Oakland, San Jose, CA). Lastly, instead of using the total number of concerts as a measurement (which would’ve just resulted in big cities like NYC dominating the list), we calculated the number of concert events per 100k residents. 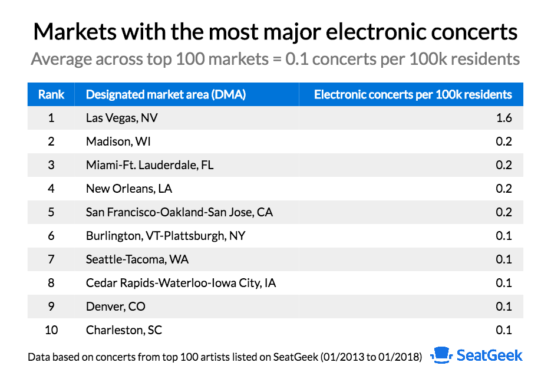 First, we wanted to see which markets had the most concerts. 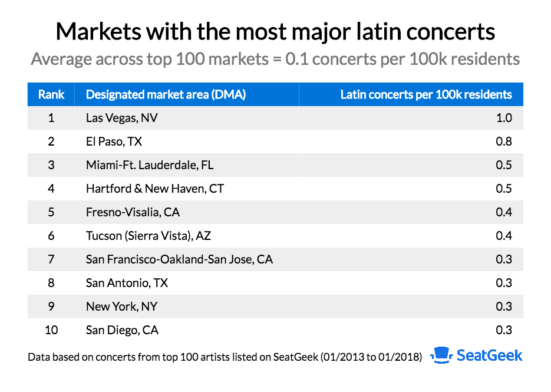 Overall, the 100 most populous markets had an average of 6.1 concerts from the top 100 grossing artists per 100k residents between 2013 and 2018. But as you’ll see below, certain cities far outranked this. 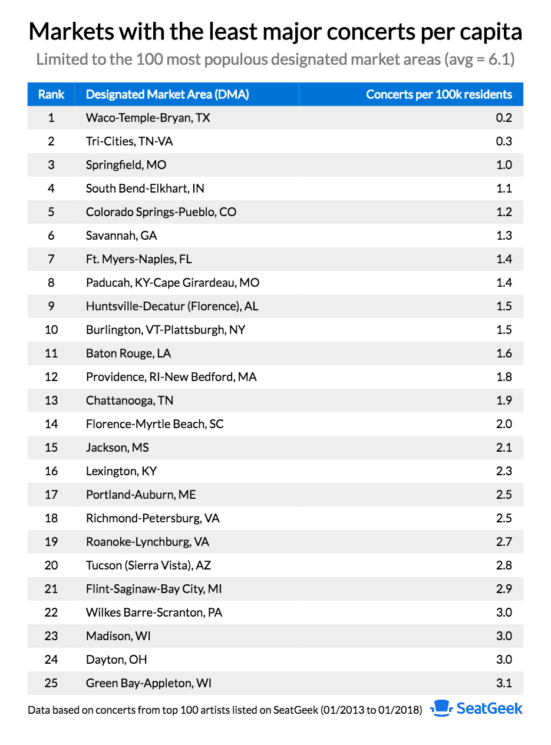 Las Vegas, NV tops the list here, with 59 concerts per 100k residents — nearly four times the next closest market, Nashville, TN (15.4). The “Entertainment Capital of the World,” Vegas is home to some of America’s most famous venus, and is renowned for its concert residencies. In our dataset, 62% of all concerts in Vegas can be attributed to two such venues: Caesars Palace, and the Axis at Planet Hollywood. Nashville, Tennessee, dubbed “Music City,” comes in a distant second here, at 15.4 concerts per 100k residents. Next, let’s turn to the most populous DMAs with the least concerts per capita. 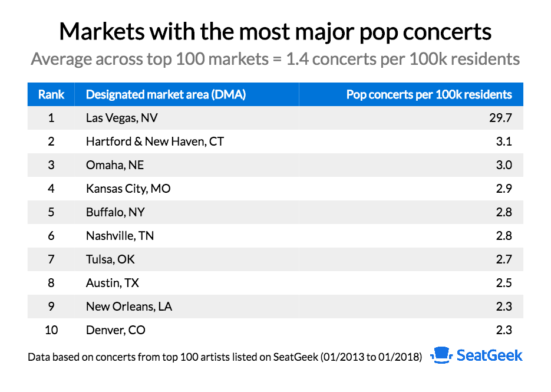 These are large media markets, but not very many concerts come to town.The DMA of Waco-Temple-Bryan, TX — a region with a population of 890k — only had two concerts from top performers listed in our dataset, as did Tri-Cities, TN-VA (population of 691k). Here, we see a lot of huge swaths of land that popular acts often skip over, or don’t spend much time in. 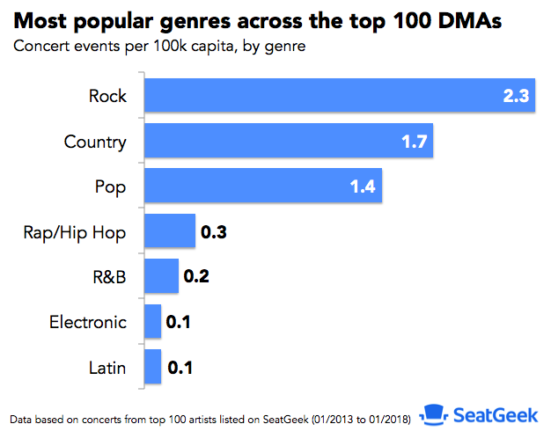 We were particularly curious to break this data down by genre, and look at top markets in the categories of rock, country, pop, rap/hip hop, R&B, electronic, and latin music. 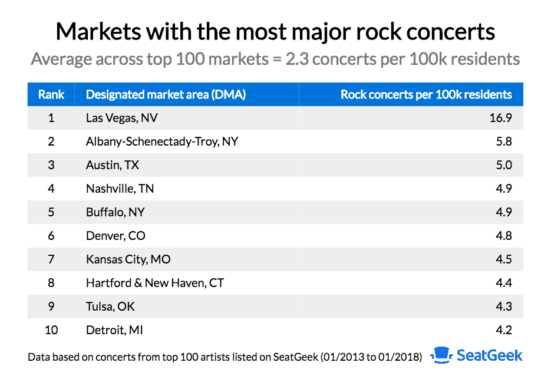 Across all markets, rock is the predominant genre, at an average of 2.3 concerts per 100k residents. Country trails at 1.7, followed by pop at 1.4. After that, there is a steep drop off: all other genres average less than 1 concert per 100k residents. Over time, rock has held its title as top genre — but there has been some fluctuation among competitors. Notably, country and rap/hip hop listings have increased in volume, while pop has declined. With these trends in mind, let’s dive into these genres individually, looking at the top 10 DMAs for each one. In the category of rock concerts, Las Vegas still holds a commanding lead, at 16.9 concerts per 100k residents. Roughly 28% of all concerts in Vegas were rock shows — and a large percentage of them were dominated by two artists: Elton John (134 performances), and Rod Stewart (67) — both of whom had long-running residences at Caesars. Trailing Vegas, we see some unexpected places, like Albany-Schenectady-Troy, NY (5.9). This is largely driven by a slew of performances at the Saratoga Performing Arts Center, by the likes of Dave Matthews Band, Bon Jovi, and Phish. Nashville (4.9) ranks a relatively low 4th here — but in the genre of country, it unsurprisingly dominates. 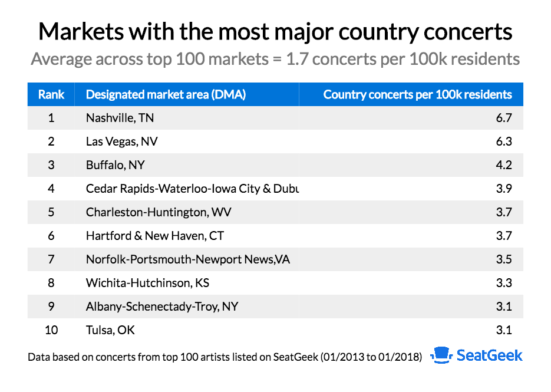 With 6.7 country concerts per 100k residents (about 4 times the national average), Nashville narrowly edges out Vegas (6.3) in the this category. The city is home to the Country Music Hall of Fame, and legendary venues like Ryman Auditorium and the Grand Ole Opry House. Nearly 50% of all major concert listings in the city are country shows — including big names like Blake Shelton, Brad Paisley, Chris Stapleton, and Eric Church. But outside of country, Vegas reclaims its top title on all remaining genre lists. 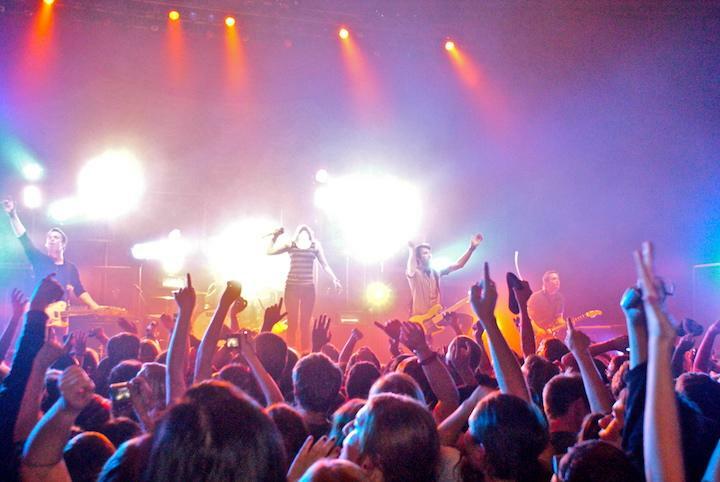 In the pop genre, Vegas (29.7 concerts per 100k residents) leads by nearly tenfold. This is driven by a lengthy residency by Celine Dion and 222 Britney Spears performances between 2014 and 2017 at the Axis. Hartford & New Haven (3.1) benefits from the large Mohegan Sun Arena, which has featured some of pop music’s biggest acts: Lady Gaga, Justin Bieber, Bruno Mars, and Selena Gomez. 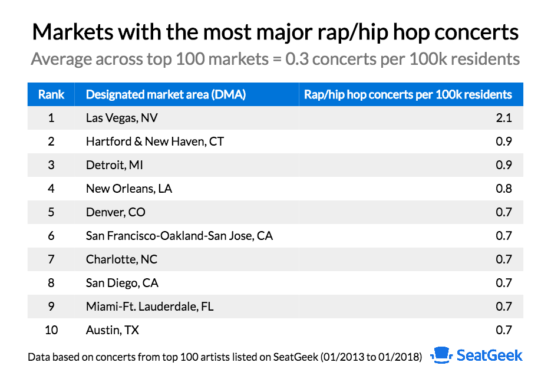 We see a very similar ranking in rap and hip-hop concerts: Vegas handily tops the list again, with 2.1 concerts per 100k residents, followed by Hartford & New Haven, CT, which has hosted Jay-Z, Drake, Pitbull, and Snoop Dogg in recent years. We also see a number of markets where famous rappers vaulted their cities into the national spotlight for rap and hip hop — including Detroit, MI (Eminem), New Orleans, LA (Lil’ Wayne), and Miami (Rick Ross). And R&B? Though Vegas once again dominates (1.3), New Orleans (0.7), Baltimore (0.5), and Miami-Ft. Lauderdale (0.4) aren’t far behind, and still handily top the national average of 0.2. 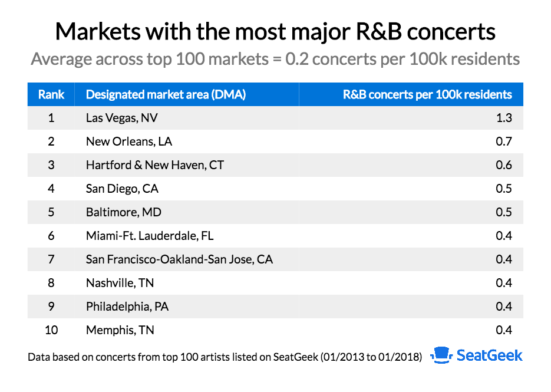 A rather surprising addition to this list is San Diego, CA (0.5), where the Valley View Casino Center saw acts like Rihanna and Alicia Keys. Madison, a college town, is fueled by performances by ODESZA at Orpheum Theatre, and San Francisco, by a 4-show run by the Swedish House Mafia at Bill Graham Civic Auditorium. And lastly, in the latin genre, we see some new cities slipping into the mix. 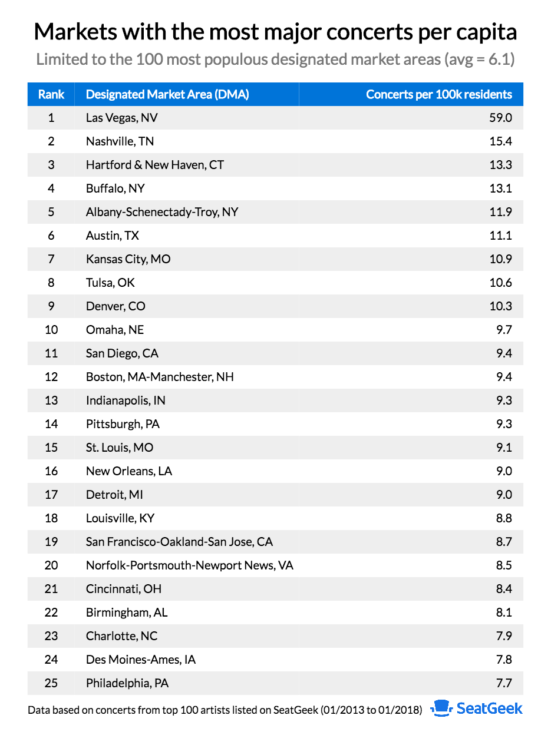 Here, Vegas still leads the pack (1.0) — but not far behind is El Paso, TX, a city with a population that is 80% Spanish-speaking. Miami-Ft. Lauderdale (0.5), Fresno-VIsalia (0.4), and San Antonio (0.3) — all DMAs that cover regions with considerable Spanish-speaking populations — also feature prominently here. With the exception of country music, Las Vegas tops every genre by a sizeable margin. The fastest-growing music market in the country, Vegas is no longer a strip for has-been musicians to perform at casinos: the city boasts multiple arenas, and a slew of 2,000+-seat venues that draw the biggest names in music for extended-stay performances.